CoasterRadio.com - Theme Park Blog and Podcast: The Results Are In! 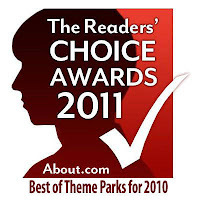 2011 marked the first year for About.com's Readers' Choice Awards for Theme Parks! Park fans passionately embraced the awards and responded with an impressive voter turnout and boisterous comments and opinions. Unlike a number of other park awards programs, what made About.com's a bit different is that it focused exclusively on achievements in the past year. Think of it as the Academy Awards or People’s Choice Awards for parks. There was no prize... just the bragging rights that come with getting recognized by the readers of a leading website owned by The New York Times. Congrats to Arthur for running such a successful awards program! You can find out more by visting his website!